← Would A Surgeon Trust Trump With A Knife? On January 20, 2017, Barack Obama will give up his presidency, leaving him fifteen weeks to fuss and fume over his inability to dislodge the Israeli elephant which sits on his back. For evidence of that elephant’s heavy and humiliating presence, start with Bibi Netanyahu’s latest in-your-face insult to the departing Obama. Ha’aretz announced the news Wednesday under the headline: “U.S. Blasts Israel’s Plan for New West Bank Settlement, Says Netanyahu Broke His Word”. The subhead continues: “In unusually harsh statement, State Department ties timing of construction plans to signing of aid deal. U.S. official says White House was livid over timing of approval of plans, which seek to resettle residents of Amona”. How is Obama expected to respond? He is a lame duck. Bibi revels in that fact. So, for the moment, Obama issues responses. His options are small in number. The Congress belongs to Israel. It is, as Pat Buchanan once said, “bought and paid for”. Mainstream TV and print media, likewise. Cable television, ditto. American Christian churches? Also bought and paid for in guilt chits and free trips. What Obama gets from the churches are resolutions issued periodically. With no national will behind him, Obama keeps White House and State computers set for “mild to harsh to outraged” responses. The U.S. administration published an unusually harsh statement on Wednesday against a plan to build an alternative settlement for residents of the illegal outpost of Amona. The statement, signed by Mark Toner, deputy spokesman for the State Department, drew an unusual linkage between the signing of the defense aid agreement with Israel and criticism of settlement building. Toner stressed that the U.S. views advancement of the plan as a violation of a commitment by Netanyahu’s government not to establish any new settlements in the West Bank. 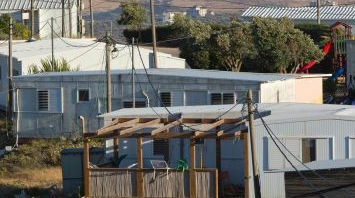 The State Department response to Israel’s Civil Administration Planning Commission’s decision “to approve a plan for the construction of 98 housing units in the new settlement to be established next to the Shvut Rachel settlement. According to the plan, it will be possible to build up to 300 housing units and an industrial zone”. The claim, of course, is that this is not a new settlement but “only a neighborhood” of the existing settlement of Shvut Rachel meant to provide housing for soon-to-be evicted residents of the illegal outposts of Amona, (below right) an unauthorized Israeli outpost in the West Bank, east of the Palestinian city of Ramallah. Shvut Rachel is an illegal Israeli settlement founded in November, 1991. It is in the Palestinian West Bank, 30 miles north of Jerusalem, surrounded by other illegal settlements, including Shilo, Giv’at Har’el, Esh Kodesh, Keeda, and Adei Ad. The land on which Shvut Rachel illegally sits is owned by Fawzi Haj Ibrahim Mohammad. Part of the charade which Israel has successfully played was to declare Mohammad’s property Israeli “state land”. Neither Obama, nor any president before him, could halt this constant expansion, a half-century long crime, committed in full view of the world. This latest U.S. response to Israel’s illegal expansion takes note of the timing of the announcement. Timing is an Israeli specialty. A senior U.S. official said that the White House boiled with anger at the advancement of the plan and even more at the timing of the decision – just a week after the signing of the military aid agreement by which the U.S. will give Israel $38 billion for a decade, and the day of the death of former president Shimon Peres, whose funeral was attended by President Barack Obama. 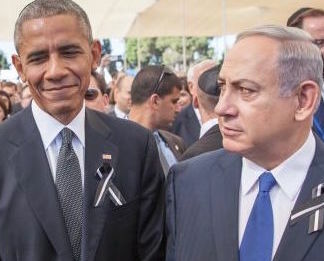 Obama had not given Netanyahu all he demanded in that $38 billion decade-long deal, angering the Israeli leader. As Obama must have expected, Bibi’s retribution was swift. Obama met with Netanyahu at Peres’ funeral (see picture above). Did Bibi assume it was inappropriate to discuss government business in a time of mourning? Don’t count on it. The headline above, “I have met the future”, is, of course, not original with me. It belongs to Lincoln Joseph Steffens. Steffens, born in 1866, began his career as a journalist at the New York Evening Post. He later became an editor of McClure’s magazine, After returning from a trip to Russia, he promoted his view of the Soviet Revolution. In the course of campaigning for U.S. food aid for Russia, Steffens made his famous remark about the new Soviet society: “I have seen the future, and it works”, a phrase he often repeated with many variations. (adapted from Wikipedia). It is impossible to peer very far into the future, but Israel’s political and emotional grip on the U.S. is so strong, it will survive unchecked for at least four or eight more years, under Clinton or Trump. Of course, before he is replaced, Barack Obama has the next fifteen weeks to take action to support Palestine at the United Nations. Such a step would make excellent going-away gifts to Palestine, Israel, and the world. The picture at top is by Emil Salman, from Ha’aretz. The picture of Amona is by Oded Balilty for AP. This entry was posted in Archives, Israel, Middle East, Netanyahu, Obama, Palestinians. Bookmark the permalink. Talk is cheap; mild or harsh makes no difference. Bargaining over the next 10 year military aid package to the Israeli government was the time and place to make a statement to the Israelis. It could not be done. Congressional, White House, and “evangelical Christian” support for the JEWISH State of Israel is too overwhelming at this point in time. We who support the End the Occupation movement grow weary of rhetoric in “condemnation” of Israeli Occupation actions increasing the settlements. Let face it. We support the status quo there, with Israel colonizing all of the land, forbidding even nonviolent resistance by the Palestinians (while accusing the Palestinians of wanting all the land). State Department bluster is meaningless, toothless, and a waste of breath and news print. Our hope is still in the Grassroots, rising up, getting the word out to our Congress people. Never giving up hope that changes will come. . . . It is not for no reason that the word, “Chutzpah”, is a uniquely integral Yiddish word. The Apartheid State of Israel and its leading Zionist “Management” in the US and Britain have been for decades demonstrating to the entire world the practice of chutzpah-in-action. It is Israel’s occupation of Palestine that has generated the volcanic hatred for Israel and its benefactors – Britain and the US, in particular. And it has been building up on an annual basis since 1948, when 80% of the native Palestinian people were forcefully evicted, or terrorized by Jewish terrorist gangs, to flee and become refugees. This gigantic hatred was initiated, created, inflated, and expanded by Israel’s occupation of Palestine. But, now, Israelis and Israel’s supporters in the US look at you, defiantly, and say that the latest aid package of $38 Billion in aid to Israel is payment for Israel’s protection of American interests in the region. It is precisely like the infamous gangsters who would steal cars and murder people, then come to the neighborhood leaders demanding protection money. No wonder, Chutzpah belongs to Israel and is an integral part of its DNA and history, since 1948. If Obama was interested in justice for Palestine, or any other agenda rather than the neo-con one, he would have supported Bernie Sanders. His choice to support all that the Dem establishment stands for, including Israel right or wrong, speaks volumes. I too saw the future, but from a different angle! The neocon warmongering godfathers of Israel are taking the country they hijacked down the road to Armageddon. All will unravel in the not too distant future on the road to Damascus. Watch this spot. Excellent comments by John and Awad. They express the way I feel about the situation, and keep wondering until when O Lord will this great nation that is leading the world and dealing with its leaders like chess pawns, will wake up and realize that it is in fact under the same occupation and dispossession of the right to self determination that we Palestinians have endured for decades. How much more humiliation can the president take before he bids the White House farewell and hopefully do something to make him worthy of the Nobel peace prize that he earned at the beginning of his first term. he treated his friends like disposable toiletries! No matter how we look at it, the whole affair between Israel and its under occupation territories, it’s non Jewish populations, and its neighbors, is turning to be the biggest and most horrific injustice in the world, and in modern times , it’s the U.S. that is paying the highest price for that injustice, and not Israel nor Britain as one might assume, what’s really bugging is the fact that America and its politicians do not admit, or even have the will to admit of these consequences, they keep daring the world and Americans here at home with acts glorifying the injustice and all its perpetrators, totally shutting down any intelligent argument or act to fix or even partially fix the huge problem. I strongly believe, that the whole Israeli affair , from its conception till today, against its occupied Palestinian territories, its different non Jewish peoples, and its neighbors, is with no doubt the biggest tragedy and injustice of modern times, the U.S. is the main payer, victim and sufferer of Israeli policies, and not Britain nor Israel itself. our politicians here in America, all bought and paid for, have no more independent visions or words of their own as to the consequences of all the continuous horrors, colonialism and applied apartheid policies, that are being attributed to America and Americans, mostly unwanted in America though, but ignored . I totally agree with Omar that it is successive US Administrations that are, and have been coerced, manipulated, and bamboozled, to pay for the sins of Israeli occupation. I must add with emphasis that one has to thoroughly separate the great American people (“If Americans Only Knew”) from their so-called “representatives”, who have been “bought and paid for” by AIPAC and its terrorist ilk. It is the successive US Administrations that have been supplying Israel with state of the art and futuristic weapons of mass murder, as well as most of America’s highly secretive and protected technologies, that sometimes end up in enemy hands. In one sentence, it is Israel’s occupation that has created all the gigantic hatred for our great country, long before American people heard of “Iraq”, “Syria”, “Iran”. “Libya”, “Yemen”, which Israel attempts to use as cover. The tragedy of the special relationship between the United States and Israel is well described in the passages of Washington’s farewell address on foreign policy. Jefferson was wrong on France, and Obama is wrong on Israel. In the northern central part of the U.S. the native peoples are attempting to stop a poisonous pipeline. We (non-natives) have been killing or evicting the native peoples for more than 300 years. Is Israel/US any different? Israel/Palestine is the site of the great experiments in weaponry and slight of hand maneuvers. It is Exile or Execution…again. Timely comments . I am thankful for the facts . Does anyone know if I would be able to grab a template GA CD 415 form to work with ? Jim, this morning, after giving your important post a second reading and reviewing the good comments, it occurs to me that our world’s problems are centered in a far larger context than merely the Palestine-Israel exercise in colonialism and oppression of one people by another (invading) people. I suggest that your title might more inclusively be “I Have Seen The Future And It Belongs To Zionism” (the Zionist entity so-called Israel being the platform from which Zionism can exploit the convenient “Holocaust” narrative while extorting more and more treasure, morality et al from its victims around the world). I once had some hope that the BRICS might provide some counter to the cancerous spread of Zionism. Now, recent happenings have made it clear that the “B” (Brazil) of BRICS has fallen prey to Zionism…stay tuned for “future” triumphs of Zionism; e.g., will the “R” of BRICS fall next?